81 Marlborough is located on the north side of Marlborough, between Berkeley and Clarendon, with 79 Marlborough to the east and 83 Marlborough to the west. 81 Marlborough was built ca. 1864 for shipping merchant and real estate investor John Lowell Gardner, one of nine contiguous houses (71-73-75-77-79-81-83-85-87 Marlborough) he had built as rental property. He and his wife, Catharine Elizabeth (Peabody) Gardner, lived at 7 Beacon and then at 182 Beacon. 71-85 Marlborough are designed as a symmetrical composition (following a pattern of c-c-b-a-a-b-c-c). 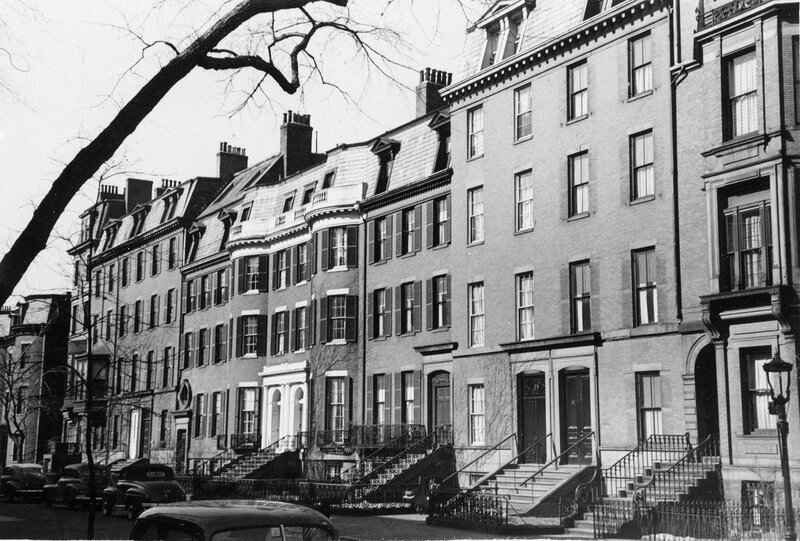 In the center are 77 and 79 Marlborough, with bow fronts and entrances that mark the center of the composition. 75 Marlborough and 81 Marlborough flank the central two houses and are designed to match each other and to have a continuous cornice line with 77-79 Marlborough. 71–73 Marlborough and 83–85 Marlborough flank 75 and 81 Marlborough and are designed to match each other, forming ends to the composition. 87 Marlborough – which gives the impression of possibly having been built as an afterthought – has the same roof and cornice design as 83-85 Marlborough, extending the composition one house further to the west, but includes an oriel window which sets it apart from the other eight houses. 71-87 Marlborough were originally numbered 65-81 Marlborough, and renumbered in about 1868 when houses were built further east. John L. Gardner contracted to purchase the land for 71-87 Marlborough from the Commonwealth of Massachusetts in the early 1860s. On December 31, 1862, he entered into a party wall agreement with Richard M. Hodges, the owner of the lot to the east where 67 Marlborough would be built, and on February 26, 1863, he entered into a party wall agreement with James T. Eldredge, owner of the lot to the west where 89 Marlborough would be built. On March 3, 1863, the Commonwealth conveyed to John L. Gardner the 200 foot wide lot where 71-87 Marlborough would be built. John Gardner died in June of 1884 and on January 3, 1885, his executors (his sons George Augustus Gardner and John Lowell Gardner, Jr., and his grandson George Peabody Gardner, son of George A. Gardner) transferred the property to themselves as trustees under his will. They continued to own the property and lease it to others. On December 21, 1899, the trustees transferred 71-73 Marlborough to John Lowell Gardner’s grandson, Francis Skinner, Jr., the son of Francis Skinner and Eliza Blanchard (Gardner) Skinner (who had died in September of 1898). On the same day, they transferred 85-87 Marlborough to John Lowell Gardner’s grandsons, Joseph Peabody Gardner, Jr., William Amory Gardner, and Augustus P. Gardner, the sons of Joseph Peabody Gardner (who had died in June of 1875) and Harriet Sears (Amory) Gardner. The trustees retained the remaining five houses (75-77-79-81-83 Marlborough). All nine houses remained rental properties until 1906-1907, when they were sold to individual purchasers. Click here for an index to the deeds for 81 Marlborough. While they were rental houses, 71-87 Marlborough tended to change occupants more frequently than many other Back Bay homes. By 1865, 81 Marlborough was the home of Mrs. Ann Pearson (Sigourney) Rollins, the widow of William Rollins. She had lived at 124 Tremont in 1864. She continued to live at 81 Marlborough until her death in October of 1866. By 1868, it was the home of John L. Gardner’s son, shipping merchant and investor George Augustus Gardner, and his wife Eliza Endicott (Peabody) Gardner. In 1865, they had lived at 7 Beacon. In 1872, George Gardner’s brother-in-law and sister, dry goods merchant Francis Skinner and his wife, Elizabeth Blanchard (Gardner) Skinner, also lived at 81 Marlborough. They had lived at 182 Beacon in 1871. 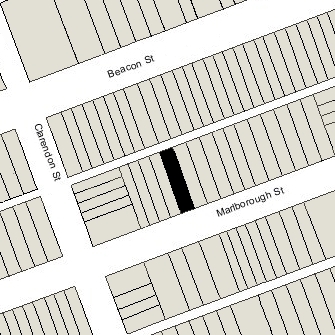 They continued to live at 81 Marlborough in 1873, but by 1874, had moved to 200 Beacon. Eliza Gardner died in January of 1876, and by 1877, George Gardner had moved to a new home he had built at 51 Commonwealth. 81 Marlborough was listed as vacant in the 1878 Blue Book. By the 1878-1879 winter season, it was the home of Dr. Algernon Sidney Coolidge, a physician, and his wife, Mary (Lowell) Coolidge. They previously had lived at 1 Fisher, and before that at 70 Chestnut. In 1871, they had lived at 71 Marlborough. Algernon Coolidge’s brother, Joseph Randolph Coolidge, was married to John Lowell Gardner’s daughter, Julia (Gardner) Coolidge; Mary (Lowell) Coolidge was the granddaughter of John Lowell Gardner’s sister, Mary (Gardner) Lowell and her husband, Francis Cabot Lowell. The Coolidges’ five children lived with them: Algernon Sidney Coolidge, Jr., Francis Lowell Coolidge, Sidney Coolidge, Ellen Wayles Coolidge, and Mary Lowell Coolidge. Sidney Coolidge moved to St. Joseph, Missouri, in the mid-1880s to work for the Kansas City, St. Joseph and Council Bluffs Railroad. He married in August of 1890 to Mary Laura Colt. Algernon Sidney Coolidge, Jr., a physician, lived with his parents at 81 Marlborough until about 1893, but had moved to 1 Exeter by 1894. Mary Lowell Coolidge married in June of 1898 to Frederick Otis Barton, a merchant in New York City. After his death in February of 1904, she and their children returned to Boston and lived at 68 Marlborough. Francis Lowell Coolidge, a cotton buyer, married in November of 1901 to Alice Brackett White. After their marriage, they lived in an apartment at 362 Commonwealth and then at 296 Marlborough. On March 2, 1907, Algernon Coolidge purchased 81 Marlborough from the trustees under John L. Gardner’s will. Algernon Coolidge died in January of 1912, and Mary Coolidge died in February of 1915. After their deaths, their daughter, Ellen Wayles Coolidge, moved live with her widowed sister, Mary (Coolidge) Barton, at 68 Marlborough during the 1915-1916 winter season. 81 Marlborough was not listed in the 1916 Blue Book. By the 1916-1917 winter season, Ellen Coolidge had resumed living at 81 Marlborough, joined by Miss Eleanor Rosalie Thornton and her sister, Janet Thornton. They previously had lived in an apartment at 92 Marlborough. Eleanor Rosalie Thornton was a music teacher, and Janet Thornton was a social worker. By 1918, Ellen Coolidge had moved to an apartment at 92 Marlborough, and the Misses Thornton had moved to an apartment at 282 Dartmouth. On April 24, 1917, 81 Marlborough was purchased from the five children of Algernon and Mary Coolidge by Dr. John Lewis Bremer. He and his wife, Mary (Bigelow) Bremer, lived at 416 Beacon. He was a physician and professor of histology at Harvard Medical School. 81 Marlborough was not listed in the 1918 and 1919 Blue Books. On February 28, 1919, 81 Marlborough was purchased from John Lewis Bremer by real estate trustee Augustus Peabody Loring, Jr., and his wife, Rosamond (Bowditch) Loring. They also maintained a home in Prides Crossing. In April of 1919, Augustus Loring applied for (and subsequently received) permission to remodel the interior of the house. It appears likely that it was at this point that the front entrance was lowered to street level and a round window added above the entrance. The remodeling was designed by Loring and Leland, architects (Augustus Loring was the first cousin, once removed, of architect Charles Greely Loring, of Loring and Leland). 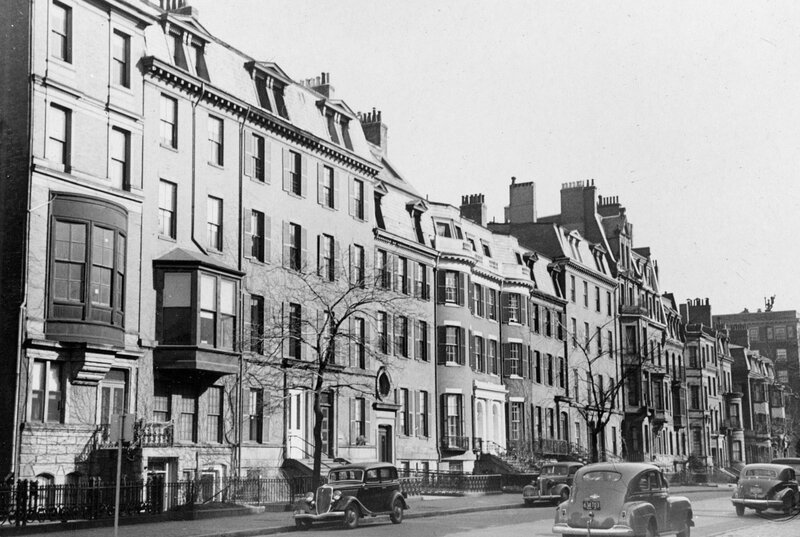 Augustus and Rosamond Loring continued to live at 81 Marlborough until about 1932, when they moved to 2 Gloucester (later numbered 404 Beacon), which he appears to have inherited from his uncle, William Caleb Loring, who died in September of 1930. By the 1932-1933 winter season, 81 Marlborough was the home of Mrs. Mary Disbro (Sylvester) Lyman, the widow of Dr. John Van Reed Lyman. John V. R. Lyman had been a physician in Eau Claire, Wisconsin, where he died in December of 1926. She was an interior decorator. She continued to live at 81 Marlborough until 1938. By 1938, it was the home of Miss Fannie Marjorie Kattelle. She previously had lived in Virginia. She continued to live at 81 Marlborough until her death in January of 1942. By 1943, 81 Marlborough was the home of Harold Pearson (Harald Persson) and his wife, Signe (Holmlin) Ivarson Pearson, who operated it as a lodging house. They previously had been lodgers at 127 Beacon. On June 25, 1946, 81 Marlborough was purchased from the Lorings by real estate dealer Thomas J. Diab, and on August 20, 1946, he sold the house to Harold and Signe Pearson. They continued to live there until about 1953. On March 18, 1954, 79 Marlborough was purchased from the Pearsons by Emil James Schiari and his wife, Dorothy E. (Johnson) Schiari, who continued to operate it as a lodging house. They previously had lived in Vermont. On February 23, 1966, he transferred the property into both of their names. Emil Schiari died in April of 1967, and Dorothy Schiari moved soon thereafter. On August 15, 1967, 81 Marlborough was acquired from Dorothy Schiari by Miss Mary Angela Cocuzzo and Miss Nancy A. Casey. They owned several Back Bay properties which they operated as lodging houses. On February 6, 1968, 81 Marlborough was acquired from Mary Cocuzzo and Nancy Casey by Francis Gerardo Mazzola, trustee of the Zzola Realty Trust. Mary Cocuzzo and Francis Mazzola were first cousins, sharing the same maternal grandparents (Mary Cocuzzo was the daughter of Domenic Cocuzzo and Angela (Deluca) Cocuzzo, and Francis Mazzola was the son of Gerardo Antonio Mazzola and Maria (DeLuca) Mazzola). The property subsequently changed hands, with the owners continuing to operate it as a lodging house. On August 3, 1979, 81 Marlborough was purchased by real estate dealer George P. Demeter. That same month, he filed for (and subsequently received) permission to convert the house from a single-family dwelling into five apartments, noting that its actual current use was as a lodging house. 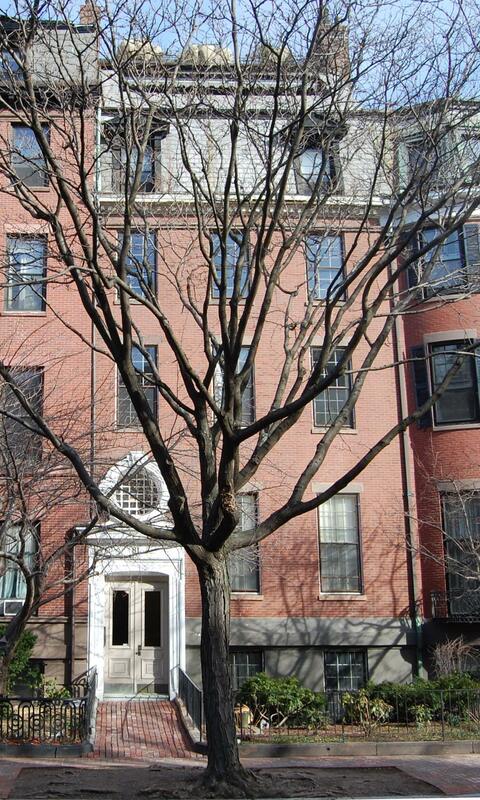 On August 7, 1980, he converted the five apartments into condominium units, the 81 Marlborough Street Condominium.